Sandra Mckeel Kowalski of Ahoskie, NC and Curtis Earl Bundy of Jamesville, NC were united in marriage on May 21, 2016 at the beach in Myrtle Beach, South Carolina. Rev. M. F. Anderson officiated. The bride is the daughter of Blanche Mckeel Harmon and Albert Bruce Mckeel. The groom is the son of Betty Goodwin Bundy and Earl Bundy. 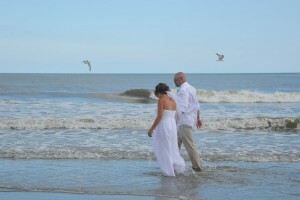 After a honeymoon in Myrtle Beach, SC, the couple will reside in Jamesville, NC. Congratulations to the happy couple, and thank you from us at Wedding Chapel by the Sea!